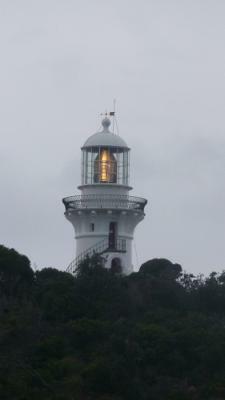 I would like to visit the Eddystone Point lighthouse after reading of the renovations in the free to read newsletter at the Lighthouses of Australia website. My husband and I will eventually visit Tasmania to see all of its culture and sightseeing. We will also visit as many lighthouses as we can. (I am the lighthouse fanatic that has written before). We have just been on a self-driving holiday from Brisbane to Newcastle following the coastline. We avoided the Pacific Highway as much as possible, visiting every lighthouse and returning on the western Highway to see the outback towns. After walking up to Sugarloaf Point Lighthouse at Seals Rocks in NSW I told the lighthouse that it was my favourite in all of Australia (having not yet visited Tasmania, of course) and its light came on. I was thrilled and excited thinking it was saying good-bye to me. The picture above is taken from the path that leads to the car park. Joanne, thanks so much for another lovely submission! Your previous submission was terrific too. I love that you are a lighthouse fanatic. Lighthouses have so much appeal - how they look, their history, the invaluable service they provide, well I'm sure I don't have to tell you what's great about lighthouses. I'm looking forward to finding out what you will say to the Eddystone Point lighthouse when you visit it - do let us know! On our recent trip to Tasmania we were determined to visit Eddystone lighthouse despite much advice not to tackle the road. We were so glad we persevered. After the tourist information staff at St Helens said no, we checked the road conditions from the police and decided we were confident to travel the gravel road. For those unused to driving on such roads a slower and careful approach is needed but the delight at the end is worth it. The lighthouse area remains almost untouched by tourism and offered some great photos. We spent quite a while around the lighthouse and the cottages and encountered a beautiful wombat who we named "the lighthouse keeper". We have to say that this lighthouse is one of the most beautiful we have seen both here , in England and Canada. Join in and write your own page! It's easy to do. How? Simply click here to return to One Day in Tasmania.